Since last time I have made a bit more progress on the blue wrap design. I have made a decision at this point to work this in two parts. I have a couple of reasons for that. 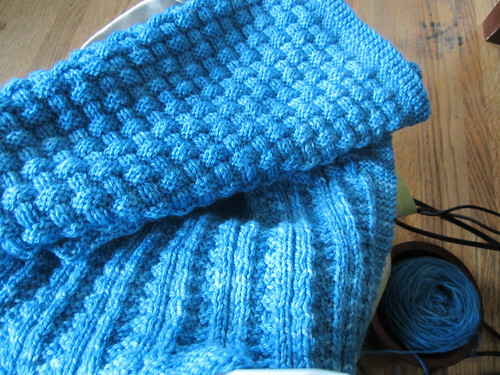 for ease of knitting; it’s hard to knit a big bulky piece reaching 5+ feet long. My thinking on the first point is that if I knit it all in one piece with such a deep border it is hard to tell when to start and be sure the yarn lasts. I am certain if I use all the yardage it will be about the right length but this way seems easiest to accomplish that goal. I took the yarn and equally divided it all in half. The plan is to knit the first half until it’s gone, or nearly since I need to end at a specific point in the pattern stitch, and then knit the other half and graft them together.The stitch pattern is such that there is a perfect point at which to do this and have the pattern remain seamless. And the third point is what swung the vote since I could possibly have lived with the extra row but since it would be easier in general to work with the smaller pieces it seems the way to go. In addition to this I also got around to swatching for another design that starting knocking about in my brain. It will be a baby garment in honor of my impending new granddaughter due in May. Since she will be born in late spring a sweater seemed less needed so I started seeing a little casual everyday dress. 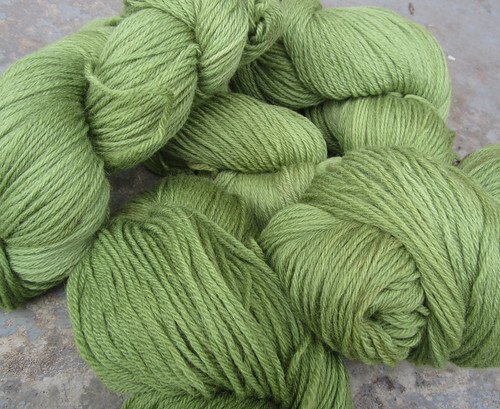 Also since it’s warm weather a light weight and all weather yarn would be best and the Classic Merino Bamboo fir that bill perfectly. I envisioned a seamless top down raglan at first with a little bit of eyelet lace in the yoke and edging. I couldn’t find the right thing when looking through all my stitch volumes. 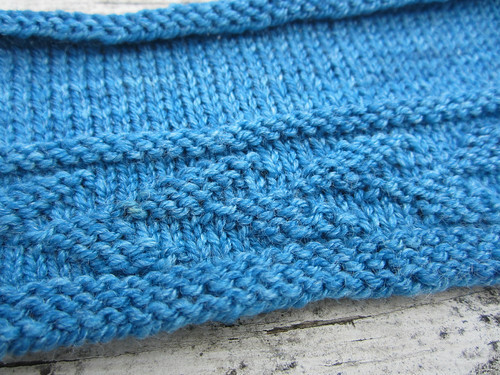 Finally this welted leaf border struck my fancy and after swatching it my plans began to reformulate and solidify. I got out my calculator and started making a rough first draft, an outline really, of how this would go to be sure I would have the correct number of stitches in place at the points where I want to add the stitch pattern, and also to make dimension plans and work out decrease rates. I realized too that it would be better to do this bottom up with a circular yoke. At this point I am planning little cap sleeves with the stitch pattern placed as you see above at the bottom hem and again in the yoke. The sleeves will probably just be a garter edging. I will decide when I get there whether to leave a Henley type opening on the back with ties or a button for closure. I also did a little fun dyeing this week for myself. 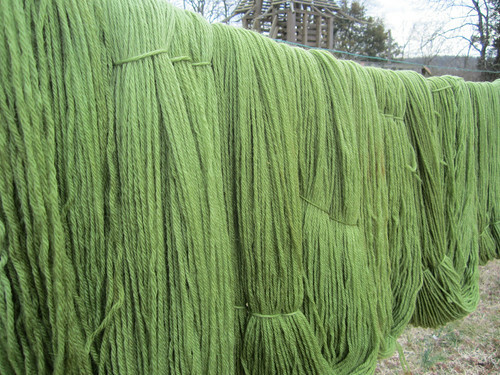 I have my eye on Antler cardigan for some time and thought it would be fun to dye some yarn up for it. 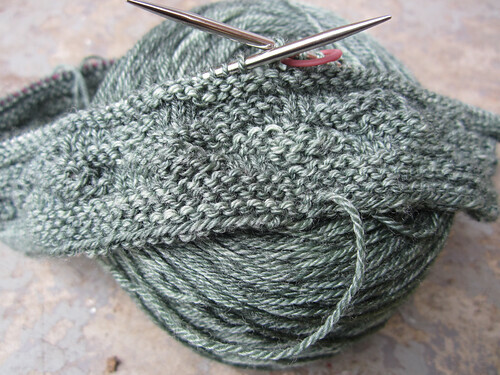 I have read/listened to several good books while working and knitting this week. I finished Clockwork Angels and it was pretty good. I valued it more for the additional dimension it added to the album which was it’s intent, so it did accomplish it’s goal. The character was a little shallow but I think it was meant to convey the concepts rather than be a story like a novel. I think a fairytale is really a better way to describe it. I saw that on someone else’s review on Goodreads and it is accurate so I will echo it here. I gave it 4 stars. I then read In the Tall Grass and I will copy from my review here: This one was creepy but to me lacking in some way. I started out the story liking the character build up but I lost it towards the end. The style of the writing shifted and got more vague and sparse. I think I just really hated what happened to Becky in there too. I gave it 3 stars which is not typical for me with a Stephen King book.